You can run the basic test without registering, or you can sign up for a free account and get a few (very few) additional features. There are also commercial “account levels” available but they’re way too expensive for ordinary mortals/hobbyist bloggers. 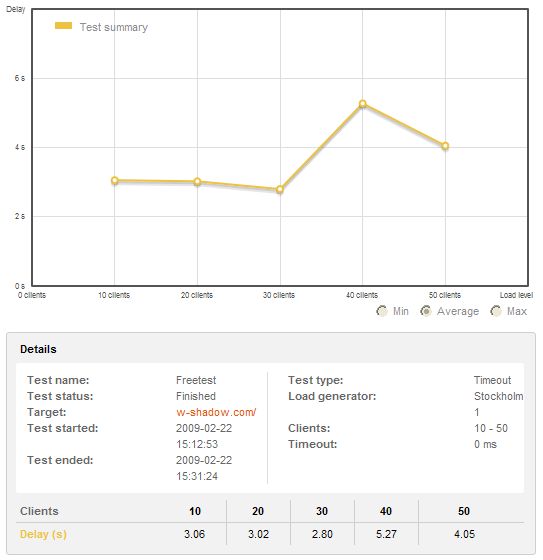 However, if you have a company that actually needs load testing for their servers, Load Impact might be an interesting option. On a related note, Pingdom Tools is also good. It’s an entirely free service that measures how long it takes to load all the components of a given webpage (e.g. images, scripts and CSS). This can be very useful when you’re trying to optimize your site/theme to load faster. This entry was posted on Sunday, February 22nd, 2009 at 20:37	and is filed under Web Development. You can follow any responses to this entry through the RSS 2.0 feed. You can leave a response, or trackback from your own site. Came across your blog while searching for facebook apps and spent more than a hour here. Your no BS no fluff blog is impressive and you have a bloggie(should rhyme with groupie) here. Hmm… I used Firebug’s NET monitor to see how much time and KBs I spent for my homepage loading session. Firebug is handy, but the results are subjective because they depend on your connection speed. I have used LoadImpact to test our website and it was very efficient. I used the paid service to be able to ramp up the user acount over 50. We were looking for tools to load test the website and when we came across loadimpact we gave the free trial a go and it worked a charm. Later on we paid for the server and ran the tests. It’s great to be able to test your live environment before you do any large PR campaigns etc, and it’s cheaper to pay for the one time use rather than purchasing a tool (however, in the long run it would probably be expensive to keep using LoadImpact). I had some issues with the tool at first but they have a support forum (I think they are quite new) and when I emailed them about my issue they actually gave me an aditional days usage and that’s good service! Cthulhu generated this page with 52 queries, in 1.024 seconds.